Each sachet contains: Inositol 2 g, Folic acid: 200 µg. Inositol: Inositol is a vitamin factor belonging to B-group vitamins. Furthermore, its biological role includes a specific activity to control the metabolism of fats and sugars and of cellular functions of the nervous system. Finally, it is essential for the growth of hair and baldness prevention. Scientific evidence demonstrates that inositol can change some hormonal parameters, such as the reduction of plasma levels of LH, testosterone and prolactin and the LH/FSH ratio. Inositol also recovers a regular menstrual cycle with ovulation. Thanks to its modulating action on the ovarian function, inositol is included into the protocols of controlled ovarian hyperstimulation. In case of insulin resistance or of type II diabetes, inositol demonstrates the ability of improving the overall metabolic picture. As far as the Polycystic Ovary Syndrome (PCOS) is concerned, inositol aids to normalize the pathophysiological mechanisms based on the related metabolic and reproductive impairments. Folic acid: Folic acid is a water-soluble vitamin belonging to group-B vitamins. Folic acid plays an essential role in the metabolism of amino acids, in the synthesis of protein and nucleic acids (above all in the production of DNA and RNA) and in the repair of chromosomes. Therefore, it is very important for the normal multiplication of cells and for the growth of tissues. Inofert can be used as an adjuvant in the protocols of controlled ovarian hyperstimulation. 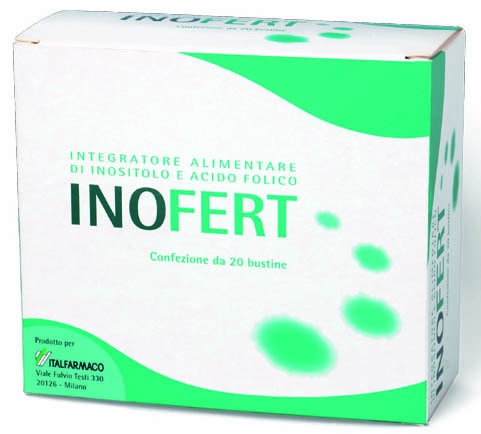 Furthermore, Inofert can be used as an adjuvant in the Polycystic Ovary Syndrome (PCOS) under conditions of insulin resistance and pre-diabetes and in type II diabetes. Inofert is a food supplement and cannot replace other therapies prescribed by the physician. It is recommended not to exceed the prescribed doses. The product should be used following a varied and well-balanced diet and adopting a healthy lifestyle. Inofert can be taken at any time during the daytime. It is recommended to take 1-2 sachet(s) daily. Dissolve the powder in a glass of water.